This is my second attempt at Parfait with my first being a wearable muslin back in April. I’ll be honest- I get distracted pretty easily so the delay was no real surprise. My original version is in a hot pink twill with yellow buttons which I may put a post up about soon. 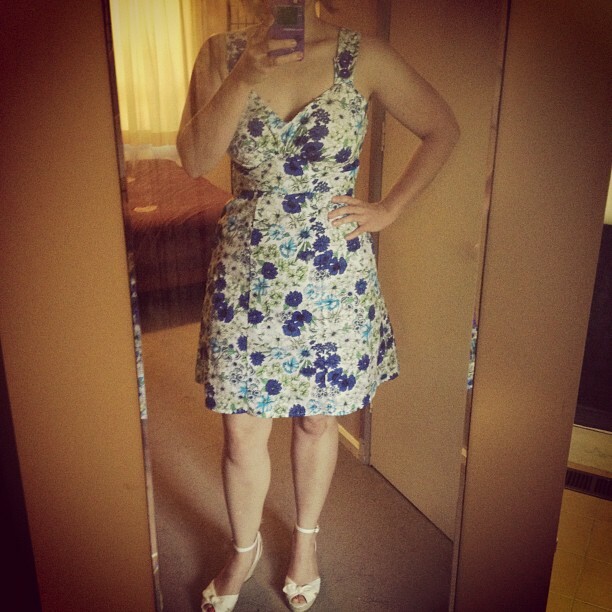 I found an epic vintage inspired floral pattern for cheap recently and knew this would make a fantastic sundress! The cute as a button blue bow headband that had just arrived from Etsy worked to get me inspired to make this straight away rather than add it to the growing pile of future projects. You can see some of the headband in the photo below. It took me a large chunk of Boxing Day evening and some of the 27th to get this finished and I am rather happy with the end result. Please excuse the dodgy camera shot- I’m giving this blog thing a try and am too embarrassed to ask the other half to take photos at this point. I love how tailored in the dress is- a boon for a curvy lady like myself. 2012 is shaping up to be my year of epic domestic goddess-ing where I aim to learn some fancy sewing skills, baking skills and being a lady skills. I’m looking forward to the inevitable hi-jinx that will ensue! Thanks, Shanni! I’m rather proud of this one!